The ETS Lindgren HI-2790B Calibration Comparison System complies with US Government (CDRH/FDA) requirements for evaluating calibration consistency of microwave oven survey meters used by oven manufacturers in compliance testing. HI-2790B allows this single new unit to replace two earlier models. With this new power/control system, only the HI-1710 Local Calibration Reference meter requires annual calibration to keep this system fully acceptable for CDRH compliance monitoring. 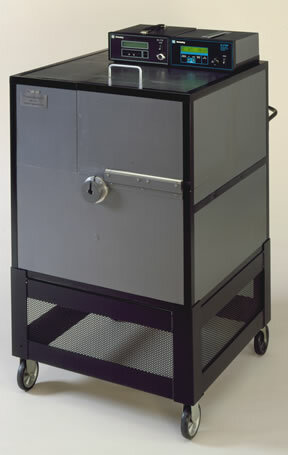 A portable anechoic chamber mounted on a frame with castor wheels for ease of movement. A Meter for monitoring power to the waveguide and forward, reflected, and transmitted power. An HI 1710 Microwave Survey Meter to serve as a Local Calibration Reference (HI 1710 LCR).